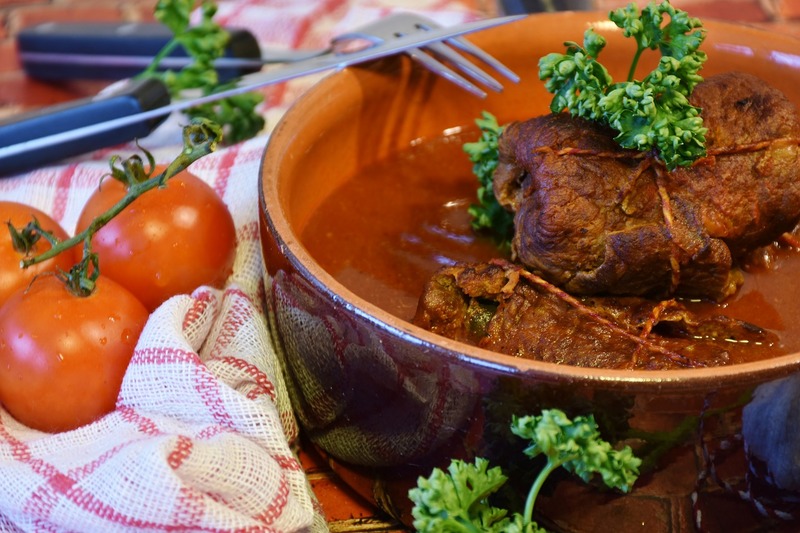 German Beef rouladen (or beef rolls) is a very delicious and popular German recipe. It is not only popular during the holidays, it is served for Sunday lunches when the whole family and friends get together. They are called in German "Rindsrouladen". The German beef rouladen are filled with bacon, onions, mustard and pickles, and are wrapped in thin sliced beef. 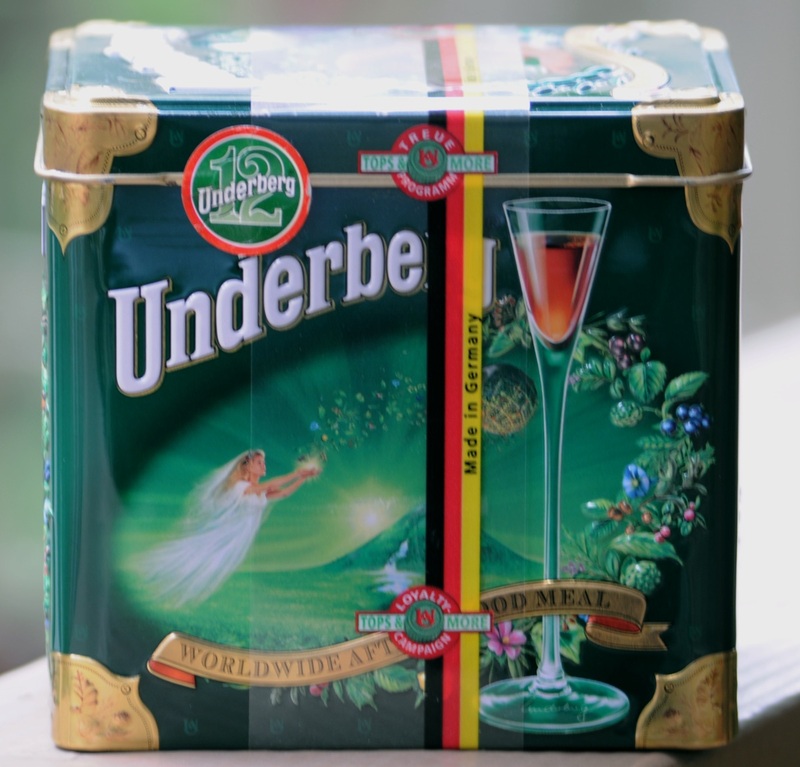 Served with mashed potatoes or Spaetzle and red cabbage, and a glass of red wine makes a delicious German dinner. You can get German pickles from the US brand Kruegermann or at Big Lots, and many local supermarkets carry the German brand Hengstenberg. You will find German mustard and pickles especially during the Oktoberfest season. Happy Cooking! - Cut the meat in 6 rectangular pieces, 1 cm or 1/2 inches thick, pound the meat if it is too thick. - Spice them with salt, pepper and red pepper (paprika) on both sides. - Spread mustard on the spiced side. - Place one thin sliced bacon stripe on top. - Chop pickles and onions. The pickles can also be sliced very fine. 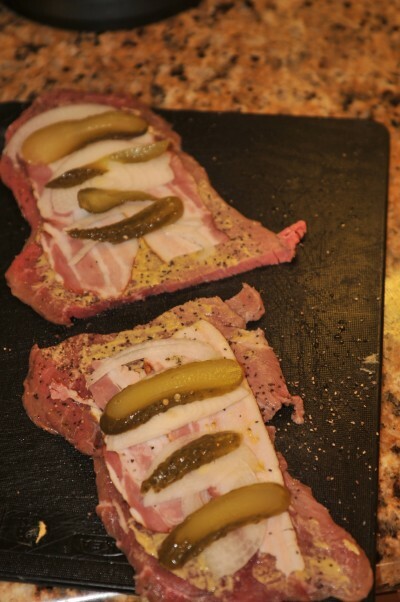 - Add onions and pickles on the meat, then roll the slice. - Use sewing cotton or metal picks to prevent that they fall apart (don't forget to remove them before serving). - Heat the oil in a frying pan and fry the rouladen from all sides really well. 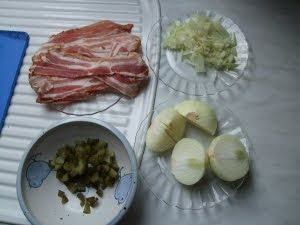 - Add celery leaves and another onion and quench it with water (or if you like you can use red wine instead). - Put on the lid and let it simmer for at least 1 1/2 hours (the meat should be very tender and might need cook longer, depending on the meat). 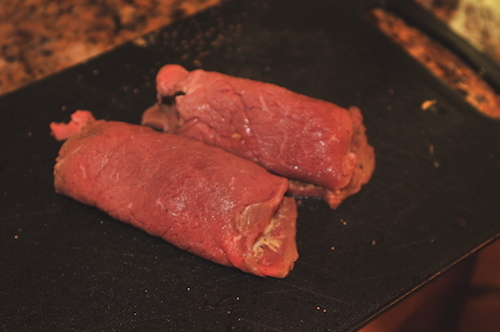 Tip: Turn Rouladen one time and add more liquid if needed. Important is that Rouladen should be always covered with liquid so they won't get dry. 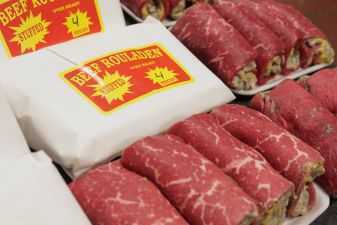 - Place the rouladen on a plate, cover with a lid or foil, keep warm in the oven while making the gravy. - Use the liquid with all ingredients, mix it very well, pour through a fine sieve. - Mix, depending on how much liquid you have, 2-5 tbsp flour or potato/corn starch with a bit of cold water or red wine, add to the beef juice. - Add some heavy cream or crème fraiche to the liquid. - Bring gravy to a brief boil. Should the gravy not have thickened, add some more starch. - Attention: Never use hot water with the starch otherwise it will clump. If needed add some salt and pepper or 2 table spoon tomato paste (adds a nice darker color). If you don't want to make the gravy from scratch use some instant gravy and stir it up with some cream. Serve it with mashed potatoes and vegetable (red cabbage or peas/carrots mix) or Spaetzle. To save time for the next meal, make the double amount and freeze the rest (without the metal picks of course). Instead using yarn to hold the rouladen together, you can use special rouladen skewers or rings that are available at Germanshop24.com.